The bathhouses, one of the three largest blocks within the fortress walls was located at the VIA PRINCIPALIS, next to the PRINCIPIA. The use was restricted to the stationed soldiers and their officers. Citizens who lived in the suburb of the fortress had no access to this premises. In order to avoid deceases and for hygienic reasons the inhabitants of the fortress had to visit the bathhouses on a regular base. 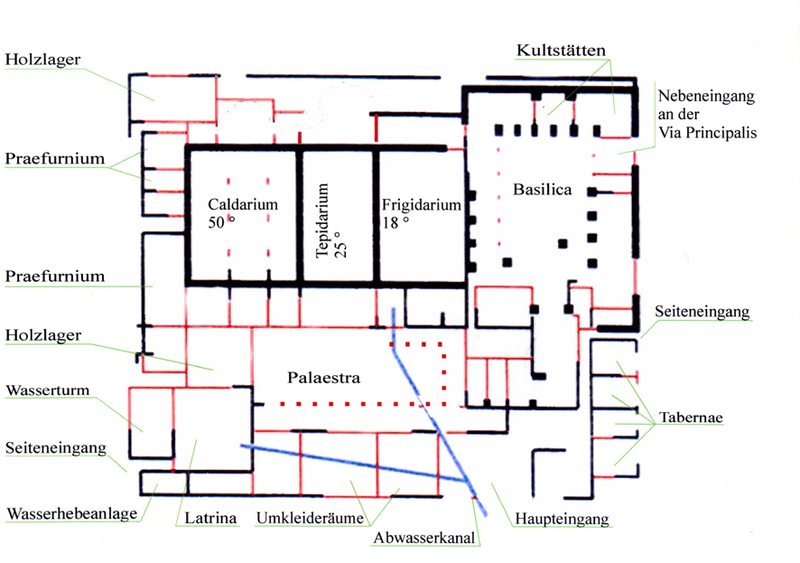 The arrangements of rooms can hardly be determined from the excavated fundamental residuals of bathhouse: 3 large rooms are particularly noticeable, 2 of which were equipped with under floor heating. The round shaped apses at the front-end of the large rooms and the wastewater pipes found, point towards a large Roman bathhouses complex. The bathhouses were something particular between the functional military buildings, due to their different outer appearance. Sophisticated skills from the Roman architects were required to drain the rainwater from the connected roofs. The water had to be drained in cascades from an area of 75 x 81 m without eave-drip channels across the roofs into the external streets of the camp. In order to get sufficient light into the interior rooms, additional eaves and ridge-heights became necessary, which resulted in extraordinary roof heights. There used to be a public water closet in the bathhouse, besides the usual under floor- and wall-heating systems. The expensive water-and heating technology needed to be operated without interruption to guarantee optimal efficiency. Large quantities of heating material and fresh-water had to be kept at disposal all the time. There is no indication so far about how the large quantities of fresh-water were brought into the bathhouses. No signs of water-tanks or aqueducts coming into the fortress from outside could be discovered till today. It can only be estimated that fresh-water was being brought into the fortress by use of a partly timbered pipeline from approx 40 km above the river Erft. Nevertheless there is no reliable evidence to proof this.